Speaking after Congress’ impressive show in MP, Rajasthan and Chhattisgarh, Rahul Gandhi says will defeat BJP again. 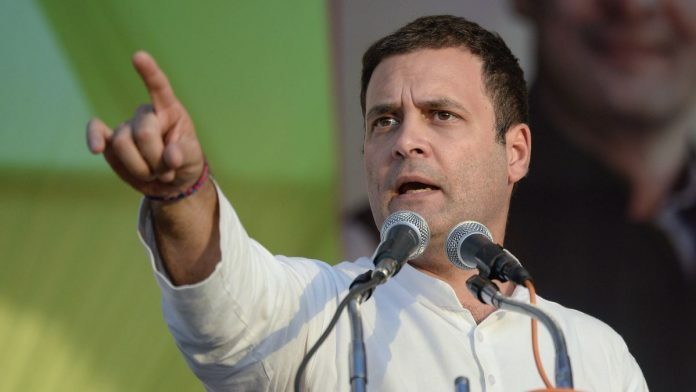 New Delhi: After an impressive show in the assembly election results Tuesday, Congress president Rahul Gandhi said the farmers and the youth of the country have spoken in favour of his party and sent a clear message to Prime Minister Narendra Modi’s Bharatiya Janata Party (BJP). “Clear message for the BJP that the country is not happy with what they are doing, with demonetisation and with GST,” Gandhi said at a press conference. “BJP and Narendra Modi have failed to provide a vision for the future of this country,” Gandhi said. “We have defeated them today. We will defeat them again. But hum kisi ko mukt nahi karna chahate (We don’t want to get rid of them),” he said, in a veiled reference to BJP’s ‘Congress-Mukt Bharat’ campaign. In the five-state assembly election results Tuesday, Congress was leading in Chhattisgarh and Rajasthan. The fight in Madhya Pradesh remained neck and neck. Gandhi said the central themes of the election were employment and farmer distress. “We need a strategic solution for these,” he said. Stressing on the “scam” that was demonestisation, and corruption in the Rafale deal, Gandhi also flagged the exit of Urjit Patel as a testament to the damage that the BJP-led government had wrecked on the Indian economy. “With a resurgent Congress party in these states, and other states where non-BJP parties have come to power, a strong opposition can be created,” Gandhi said. The party’s performance in the three crucial states of the Hindi heartland has come as a big boost for Gandhi ahead of the Lok Sabha elections in 2019. The assembly elections were being seen as a critical test of Gandhi’s leadership, who took over the reigns of the party exactly a year ago.